The German company vowed to get its Asia Pacific business back on track after the problems pushed its first-quarter earnings and revenue below analyst forecasts. Its shares fell 2.8 percent on Friday. SAP and rivals such as IBM and Oracle are dashing to meet surging demand for cloud computing, which allows clients to reduce costs by ditching bulky and costly servers for network-based software and storage in remote data centers. With the cloud services market forecast to grow 18.5 percent this year to $131 billion worldwide, according to research firm Gartner, competition is fierce and software firms face a challenge to adapt. “We had some leadership changes in the region. That is why we saw some misses in the quarter,” said SAP’s co-Chief Executive Jim Hagemann Snabe. He promised the Asia Pacific region would be back on track in the second quarter as the sales pipeline looked good and important sales positions were now taken care of. SAP shares were down 2.8 percent at 57.95 euros by 0932 GMT, while a broader index of European technology companies was down 0.7 percent. The biggest disappointment in SAP’s quarterly results was SAP’s performance in the Asia Pacific Japan region (APJ), said Stacy Pollard, an analyst at JP Morgan. Its software and cloud subscription revenue there declined 7 percent, lagging the Americas, where revenue jumped 49 percent, and Europe, the Middle East and Africa, where it grew 13 percent. “While weakness from other software and IT services names over the last month had already pushed down expectations (and the SAP share price), we would still expect another 3 to 4 percent correction to shares today,” Pollard said. 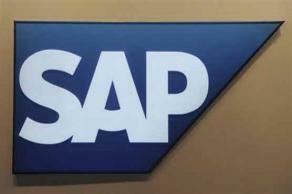 SAP software helps companies to manage supplies, human resources and customers relations. It is reducing its reliance on traditional business software to become a major player in cloud computing. Snabe said the industry was transforming as customers turned to web-based software products. “Hardware is in trouble,” he told Reuters Insider. SAP faces competition in Internet-based software from IBM and Oracle and nimbler rivals like Salesforce.com Inc and Workday Inc. It spent $7.7 billion last year to buy Internet-based computing companies Ariba and SuccessFactors. Its main competitor, Oracle, reported a 2 percent drop in software sales in its fiscal third-quarter ended in February. SAP said it had snatched market share from Oracle and others as customers turn to cloud services, which are seen as less vulnerable to the global economic downturn as there are no upfront costs for program licenses, hardware or installation. SAP said it still expected operating profit this year to be 5.85 billion to 5.95 billion euros ($7.65-7.78 billion) at constant currencies, up 12-14 percent from 5.21 billion in 2012. SAP’s first-quarter operating profit excluding special items rose 8 percent to 901 million euros, missing an average forecast of 968 million in a Reuters poll of analysts. Revenue was also up 8 percent at 3.64 billion euros, but missed even the most pessimistic estimate in the Reuters poll, where individual estimates ranged from 3.73 to 3.9 billion.